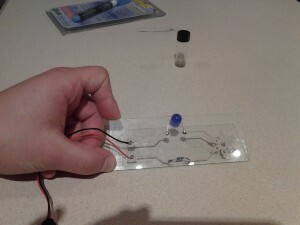 Jordan Bunker from Pumping Station: One has been making his own conductive ink based on a paper written by researchers at the UIUC Materials Research Laboratory. This technique uses easily obtainable materials and tools, and can be reproduced at most hackerspaces. For now, the ink doesn’t work on porous materials, such as a paper, and plastic and glass substrates must be etched first, but Jordan is working on addressing these issues and will keep posting developments. In the meantime he worked out a pretty simple process to manufacture conductive ink! This ink seems to address many of the problems that other inks have. Itâ€™s particle free (wonâ€™t clog print heads! ), is easy to make, and anneals to the conductivity of bulk silver at only 90 degrees Centigrade (194 degrees Fahrenheit). Check out his description of the process on the video above and then head over to his website for a detailed tutorial on how to make your own conductive ink. Bonus points for making your own vortex mixer based on onetruecathal’s video tutorial.